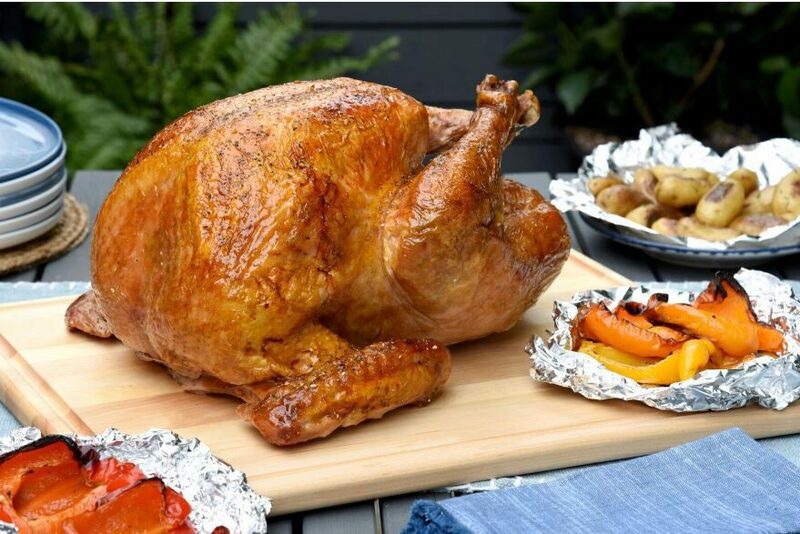 TIP: If your turkey starts to char a little on the grill, cover loosely with tin foil. Remove the foil during the last hour of cooking to let the skin crisp up. Dry turkey, inside and out, with paper towels. Season the turkey with oil, salt and pepper, inside and out. Stuff the cavity with lemon pieces. Pre-heat BBQ to 350°F (175°C). BBQ, with indirect heat, for 15 minutes per pound, until a meat thermometer inserted into the thickest part of the meat registers 180°F (82°C). Ensure you use a meat thermometer to check for doneness as cooking times can vary significantly with individual BBQ’s. Combine finishing sauce ingredients in a bowl. 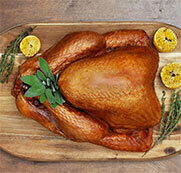 During the last hour of cooking, baste the turkey with the finishing sauce, every 15 minutes. Discard any sauce that may remain. Remove the turkey from the BBQ and let rest for at least 20 – 30 minutes. Discard lemon pieces from the cavity.